Uniken eliminates the tension between delivering a great client experience (app store ratings) and providing amazing security. Customers don't want tokens, challenge questions, or the constant need to prove who they are in this day and age. We understand this and allows you to meet these needs quickly, cost effectively and in a way that drives further engagement due to the relative ease of use. 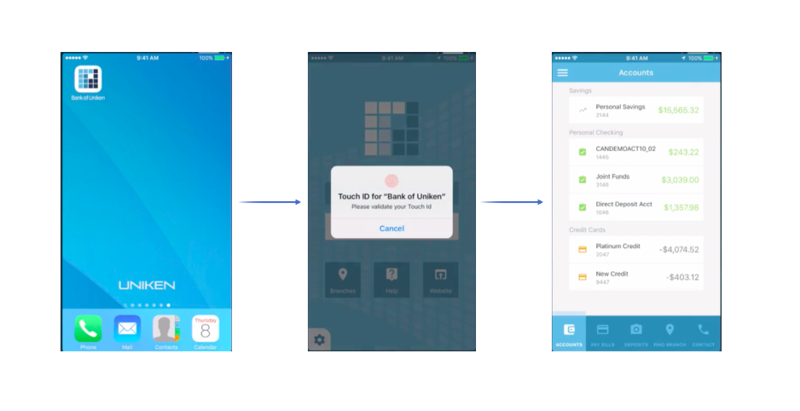 With REL-ID, your client launches your app, performs a quick biometric authentication, and uses your app. It’s that simple. No logins, no tokens, no text codes to enter. So long as they're using your legitimate app from a known and trusted device, the strong authentication and bulletproof channel security we provide is completely transparent to them. REL-ID delivers this phenomenal client experience while still providing amazing security that keeps you and your customers safe. Each transaction goes through a battery of validation steps to ensure that the device is safe, your app is clean, and the user and the service are both authenticated to each other. It's Defense in Depth, delivered with no tax on the client experience. REL-ID leverages the one thing that your users are never going to be without -- their mobile device. You can now give your clients the anytime, anywhere engagement model that your digital strategy desires by giving your apps the ability to deliver all those capabilities you’ve been yearning to unleash, but haven’t been able to because of security or compliance concerns. From footprint to performance to customer experience to security, REL-ID is optimized to build deep trust with your client using the mobile channel, and then leveraging that trust to deliver strong and seamless transactionality across every channel in your business. REL-ID delivers the same transparently secure and seamless experience your customers expect across all the channels they use to transact with you. When they call in, access your website (even from a public computer or kiosk), or come to one of your locations, they go through the same fast, easy, and secure process to authenticate themselves to you. They know they're actually talking to you, and you know that they are who they say they are. This also applies to offline or asynchronous transactions like a a client leaving you a voice-mail, sending you a text or email, or even calling you directly and not into a call center. We know that security can't impede the speed of business. REL-ID provides the phenomenal customer experience your clients crave and make it super easy for them to transact with you, and we do it without cutting any security corners. Our customers have reported 3X to 4X improvement in client engagement on the mobile channel due to the improved ease of access to their services.